Repairing sidewalks when a home is sold can fix our sidewalks bit by bit. Broken sidewalks make the city less accessible, especially for the blind and those who use wheelchairs, canes, or walkers. Accessible sidewalks have emerged as an important legal issue since the US Ninth Circuit Court of Appeals ruled in 2002 that the Americans with Disabilities Act (ADA) applies to sidewalks. In 2003 the US Supreme Court declined to overturn the Ninth Circuit ruling. Accessible sidewalks have emerged as an important legal issue since the US Ninth Circuit Court of Appeals ruled in 2002 that the Americans with Disabilities Act (ADA) applies to sidewalks. Similar ADA lawsuits have since been filed against other cities, including Los Angeles. How will these cities find all the money needed to repair their sidewalks when they already face fiscal hard times? Some cities have adopted a new strategy that doesn’t cost the city anything: require owners to repair broken sidewalks before they sell their property. Who Should Pay to Repair Sidewalks? Requiring sidewalk repairs before sale will make the city more accessible, but critics may object that cities are simply shifting the responsibility for repairs onto property owners. In California, however, property owners are already responsible for sidewalks. California’s Streets and Highways Code states, “The owners of lots or portions of lots fronting on any portion of a public street shall maintain any sidewalk in such condition that the sidewalk will not endanger persons or property and maintain it in a condition which will not interfere with the public convenience.” Property owners also pay for sidewalk repairs in many other states. A survey of 82 cities in 45 states found that 40 percent of the cities require property owners to pay the full cost of repairing sidewalks, 46 percent share the cost with property owners, and only 13 percent pay the full cost of repairing sidewalks. 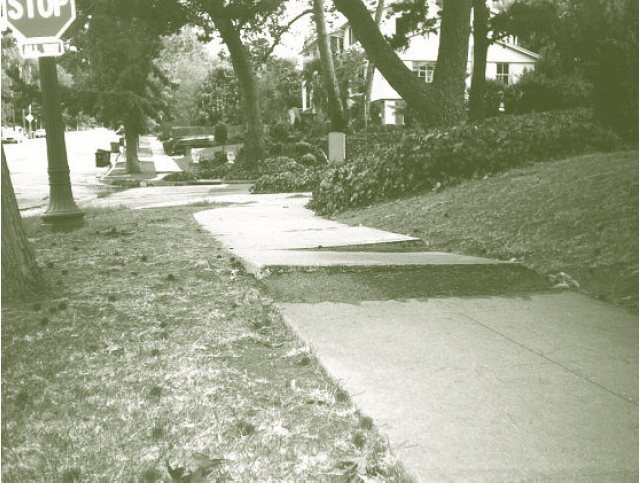 Los Angeles followed the state code until 1973, when federal funds became available to repair sidewalks at no cost to property owners. Because of this federal funding, the city assumed responsibility for most sidewalk repairs. 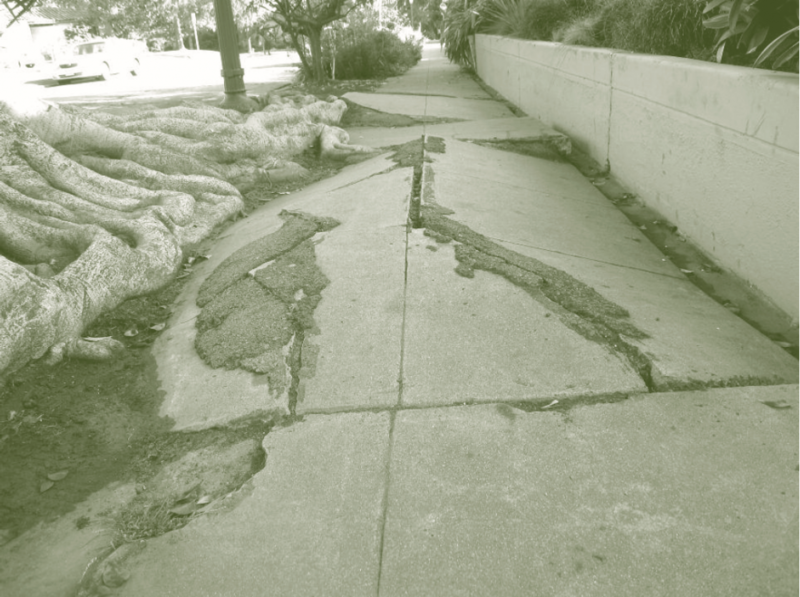 Three years later, when the federal funds ran out, Los Angeles was left with no sidewalk repair program. Then, in 1978, California voters adopted Proposition 13, which limited property tax rates, and public funds became even scarcer. 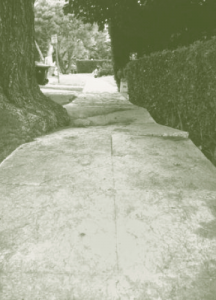 By 1980, when the city attempted to reinstate the previous policy of citing property owners for damaged sidewalks and requiring them to pay for repairs, owners objected to the “new” mandate and the city halted citations. 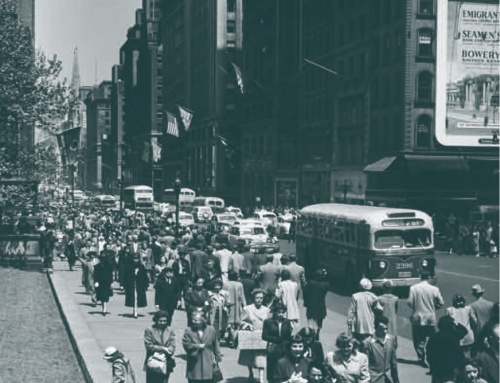 Because the city was short of money, it began to make only temporary asphalt patches to cracked sidewalks or—more often—did nothing at all. The resulting sidewalk decay led to the current state of serious disrepair. How does a point-of-sale strategy work? Before any sale, the city inspects the sidewalk fronting the property. If the inspector finds that damage or displacement of the sidewalk creates an unsafe condition, the owner must pay to fix it before completing the sale. Piedmont, California, for example, requires, “New sidewalks and/or driveways must be constructed if required by the superintendent of streets . . . in conjunction with the sale of real property.” Piedmont’s ordinance mandates repairs if the vertical displacement of a break is 3/4 of an inch or less, and reconstruction if the vertical displacement exceeds 3/4 of an inch. Pasadena, California, has a similar at-sale sidewalk repair program. Point-of-sale programs like those in Piedmont and Pasadena have several advantages beyond complying with the ADA. First, the city does not require owners to pay or do anything until they sell a property. 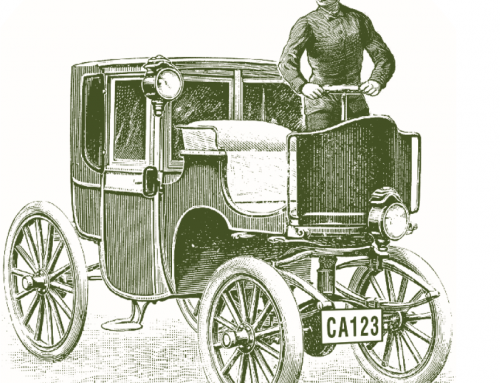 The sale then provides the cash to pay for required repairs. Sellers fix only the sidewalk fronting their own property, so they can see exactly where their money is going. Second, sidewalk repairs are gradual but inevitable because about half of all properties are sold at least once every decade. The property turnover rate is similar throughout most cities, so the sidewalks are repaired everywhere in a city at roughly the same rate. A property’s value will increase not only because of its own sidewalk repairs but also because of all other nearby repairs. Third, sidewalk repairs can increase a property’s “curb appeal” and thus increase its market value. A property’s value will increase not only because of its own sidewalk repairs but also because of all other nearby repairs. Everyone can benefit if property owners accept the obligation to repair their own sidewalks before selling their property. Fourth, the city does not have to raise taxes to pay for sidewalk repairs. The city even saves money because of fewer trip-and-fall lawsuits. Among claims against the city for trip-and-fall incidents on Los Angeles sidewalks between 2001 and 2007, 36 percent of the incidents occurred in front of properties that had been sold within the previous five years. Los Angeles paid $1.4 million to settle the claims for these incidents, which were preventable unless the sidewalks cracked in the five years between the last property sale and the trip-and-fall incident. Finally, sellers include absentee owners and residents who are leaving the city. Their sidewalk repairs will leave the city in better shape for everyone who remains. How Does a Point-of-Sale Program Work? To manage a point-of-sale program, a city can require that the escrow documents at sale include a certificate of compliance with the sidewalk ordinance. The process starts when an owner requests the city to inspect a sidewalk. If the sidewalk is in good repair, the inspector issues a compliance certificate. If the sidewalk is damaged, however, the inspector estimates what the city would charge to repair it. The owner has several options at that point. 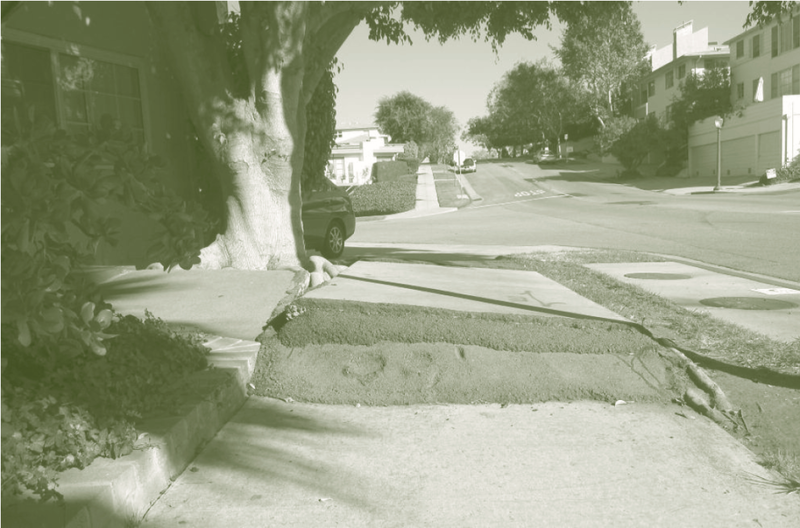 The process starts when an owner requests the city to inspect a sidewalk. First, the owner can pay the city to repair the sidewalk. The inspector then issues a compliance certificate and the city makes the repairs. Second, the owner can accept a lien on the property for the estimated cost of the repairs. The inspector then issues a compliance certificate and the city makes the repairs; the city is repaid for the lien plus accrued interest at sale. Finally, the owner can choose to have a private contractor perform the work. In that case, the owner or contractor requests a permit and completes the work; the city inspects the work, and if it is satisfactory the inspector issues a compliance certificate. If the next owner intends to redevelop the property, repairing the sidewalk at sale may be premature. In this case, the city can allow the seller to shift the responsibility for repairs to the buyer. The city can inspect the property at the end of a specific time period after the sale (such as one year), and cite the new owner if the required repairs have not been completed. Piedmont charges $30 for issuing a certificate of compliance, which is the city’s estimated cost of making the inspection. The inspectors can enter the records into a geographic database that shows the condition of sidewalks throughout the city. The point-of-sale program can be part of the city’s plan to make its public sidewalks accessible, and the point-of-sale database will show the city’s progress toward meeting the plan’s goals. Who would be liable for sidewalk repairs when a unit is sold—the unit’s owner or the condominium association? Condominiums present a potential hitch in the process. Who would be liable for sidewalk repairs when a unit is sold—the unit’s owner or the condominium association? 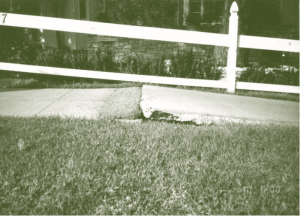 One solution is to exempt individual units but require condominium associations to repair their sidewalks within a specified time after the ordinance is adopted, with periodic inspections to ensure continued compliance. Sidewalk repairs in Los Angeles typically cost between $1,000 and $1,500. If owners pay the city before it makes the repairs, the city will have idle funds to invest between the payments and the repairs. A city can also go beyond the basic point-of-sale plan by offering to repair sidewalks before sale and receive payment at sale. The city will, in effect, lend owners the money to pay for sidewalk repairs for as long as they continue to own the property. Owners can repay all or part of the debt before they sell the property, and any remaining debt is due at sale. If owners pay a market interest rate on the debt, the government loses nothing by accelerating the repairs. Some cities already allow property owners to defer paying special assessments, with interest, until they sell their property. This option to pay at sale has several benefits. First, the program increases public investment without any public subsidy. The city runs little risk of borrowers’ defaulting on the debt for sidewalk repairs because cash is available from the sale of the property when the debt is due. A public lien is senior to any mortgage, so even if property values decline and the owner has no equity, the city will be repaid in full. Where land values are high, and sidewalk improvements increase them further, most owners will have more than sufficient equity to repay the cost of repairs, plus accrued interest, at sale. Owners who wish to avoid the interest expense can always opt to repay the debt before sale. Where land values are high, and sidewalk improvements increase them further, most owners will have more than sufficient equity to repay the cost of repairs, plus accrued interest, at sale. Second, deferring payments until sale has a strong political advantage. 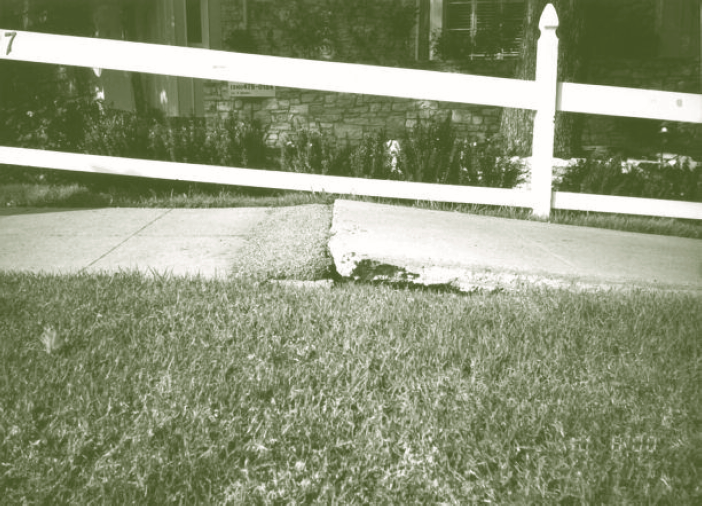 Finding the cash to repair the sidewalk before sale could be difficult for many owners, but allowing owners to pay at sale will eliminate any cash-flow problem. Cash from the sale gives owners the ability to pay. Elected officials can thus vote for a point-of-sale requirement with a clear conscience. 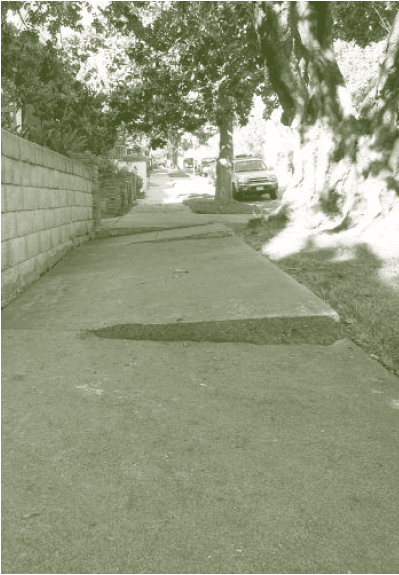 Third, the deferment option will allow the city to cite property owners whose severely damaged sidewalks create an immediate danger to pedestrians. Requiring prompt repairs in these cases will increase public safety, remove barriers to persons with disabilities, and reduce claims from trip-and-fall lawsuits without creating a financial hardship for either property owners or the city. Fourth, the requirement to repair at sale, combined with the ability to delay payment until sale, may spur some owners to make repairs as soon as a sidewalk breaks. They may repair early because (a) they want the safe sidewalk they will eventually have to provide anyway, (b) they expect repairs will be more expensive later, (c) they want to avoid trip-and-fall injuries, and/or (d) they want to increase their property value. How fast will a point-of-sale program repair a city’s sidewalks? How long will it take, for example, before half the broken sidewalks have been repaired? 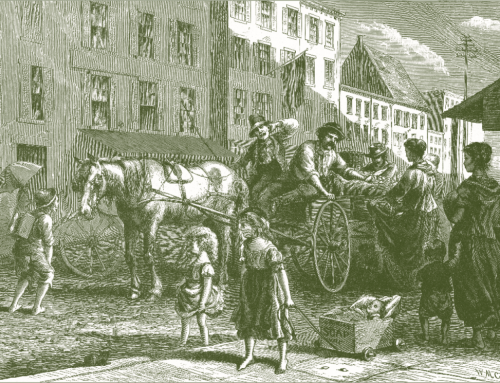 We can answer this question by examining the history of property sales in a city. I used data from the Los Angeles County Assessor to find the last sale date for every property in the City of Los Angeles. Half of the 768,922 properties in the city changed ownership at least once between January 1, 1995 and December 31, 2006. If sidewalks fronting the sold properties are as likely to need repair as sidewalks fronting all properties, a point-of-sale program adopted at the beginning of 1995 would have repaired half the city’s broken sidewalks in 12 years, much faster than the current pace of repairs. In 2002, the US Ninth Circuit Court ruled that the ADA applies to public sidewalks. As a result, cities must develop transition plans to ensure that their sidewalks are accessible. In this case, as in many others, what is good for people with disabilities—repairing broken sidewalks—is also good for everyone else. The ADA will force cities to do what they should be doing anyway: maintain their public infrastructure. To ensure a steady flow of sidewalk improvements, cities can require property owners to fix their sidewalks when they sell their property. Before any real estate is sold, the city will inspect the sidewalk fronting the property. If the sidewalk is in good condition, the owner will not be required to do anything. If the sidewalk is broken, the city will require the owner to repair it before selling the property and the owner can put off paying for the repairs until sale. With a point-of-sale program, all property owners will have to do their part, sooner or later. A better world often arrives in small steps, but we need reasons to take these steps. With a point-of-sale program, all property owners will have to do their part, sooner or later. Walkable cities need good sidewalks, and requiring sidewalk repairs at sale will help put cities back on their feet. Class Action Settlement Agreement, Barden v. City of Sacramento. 2002. Donald Shoup. 1994. 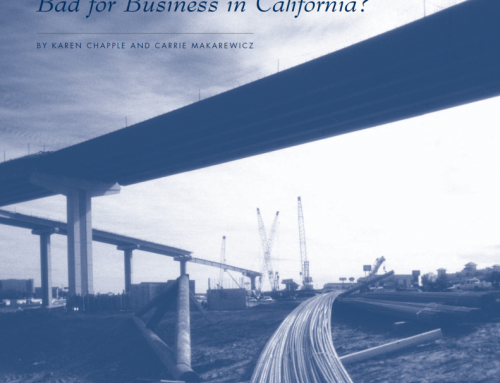 “Is Underinvestment in Public Infrastructure an Anomaly?” in Gareth Jones and Peter Ward (eds. ), Methodology for Land and Housing Market Analysis, London: UCL Press, pp. 236–250. Donald Shoup. 1996. “Regulating Land Use at Sale,” Journal of the American Planning Association, vol. 62, no. 3, Summer, pp. 354–372. Donald Shoup. 2010. 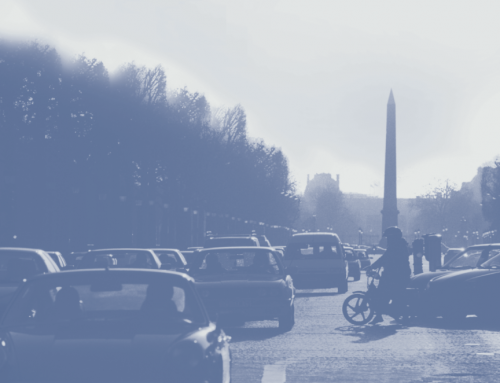 “Putting Cities Back on Their Feet,” Journal of Urban Planning and Development. vol. 136, no. 3, September.